The concept described by PC World works as follows: When a color printer (or a color copier) prints a document, it adds a pattern of tiny yellow dots (about 0.1 millimeter in diameter) to the paper. These dots are barely visible to the naked eye. The dots encode a message, which includes an identification of the printer as well as the date and time of the printing process. This means: If one knows the code, one can easily determine the origin of a printout just by looking at it. The yellow dot code, also known as Machine Identification Code (MIC), has been around for about 25 years. As it seems, different printer manufacturers use different dot codes. In the years after the PC World article, members of the Electronic Frontier Foundation and others examined Machine Identification Codes and found out a few details about them. However, neither a printer producer nor a state authority has ever published any substancial information about this concept. Machine Identification Codes are not to be confused with digital water marks on banknotes, which allow photocopy machines and graphics editors to detect and refuse copying of bank notes. 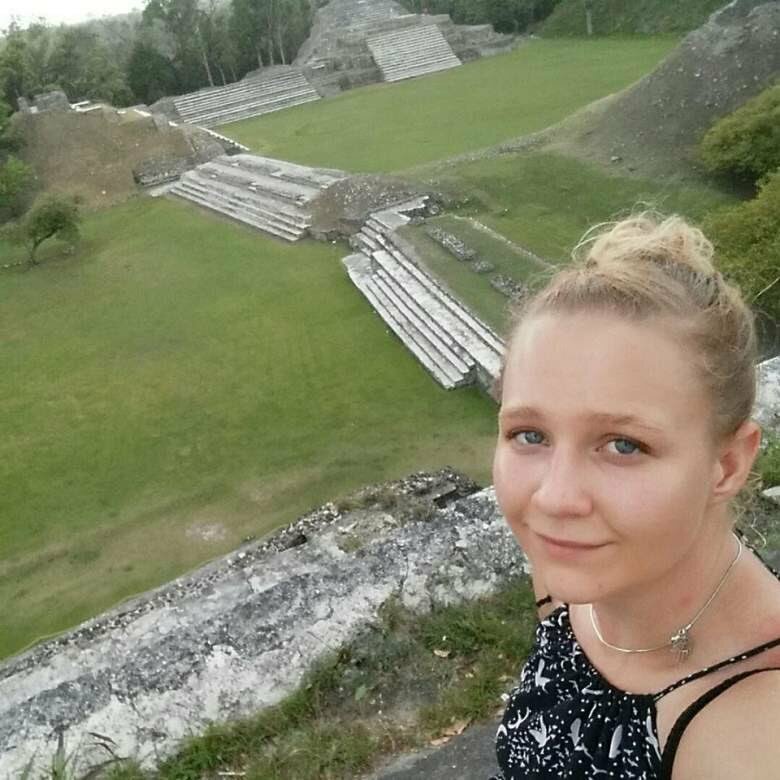 According to press reports, whistleblower Reality Winner, an employee of a US military contractor who leaked classified data via the platform The Intercept, was caught because law enforcement used the yellow dots code to identify the printer she had used to print out the material she was going to leak. Last year I wrote two blog posts about Machine Identification Codes. My latest book Versteckte Botschaften (2nd edition) contains a chapter about this subject, too. Virtually all the information I found about Machine Identification Codes was over ten years old. There has not been much media coverage in the last decade, apart from the Reality Winner case. A few days ago, reports about a method that overprints the yellow dots and thus makes the code unusuable hit the media. The method was developed by researchers of the University of Dresden, Germany. 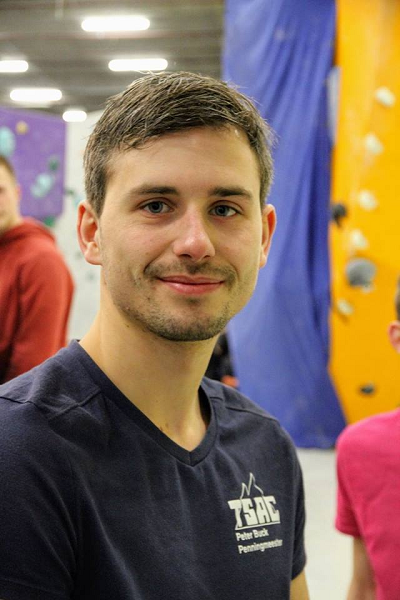 … informed me that a research work about the yellow dots code he wrote is now finished and available for download. 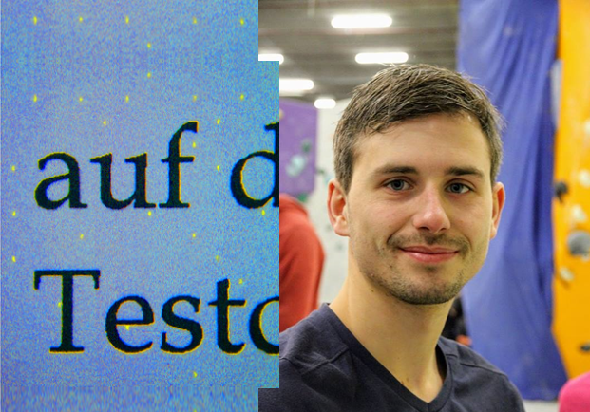 In my view, this 30 pages paper (it is referred to as “dissertation”, which is a little confusing for Germans, as a dissertation in Germany usually is a PHD thesis) is the most important work about the yellow dots code that has been published in recent years. With the first method method (physical), the paper is illuminated with a blue light. This light makes the yellow dots appear black. These dots can then be observed using a magnifying glass. The physical method is useful for an immediate analysis of a document because it can be used at a crime scene. The second method is digital. Scanning a document with specific settings can make the yellow dots visible. Essential settings are DPI, sharpness, darkness and contrast. Furthermore, the scanner must use limited compression. Some imaging tools can change the color channels of an image. Deleting both the green and red channels results in a grayscale image of the blue channel. This grayscale image then shows the dots. Column 10 was previously thought to be a separator between the serial number and the date and time of printing. As Peter found out, it is instead a line which defines whether a document has been printed or copied. If column 10 is filled, the document is printed. If it is empty, except the parity bit, the document is copied. 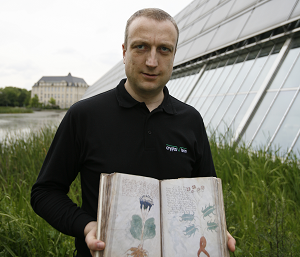 Peter’s main research result is the decoding of another code, used by HP, Kyocera Lexmark, and Ricoh. 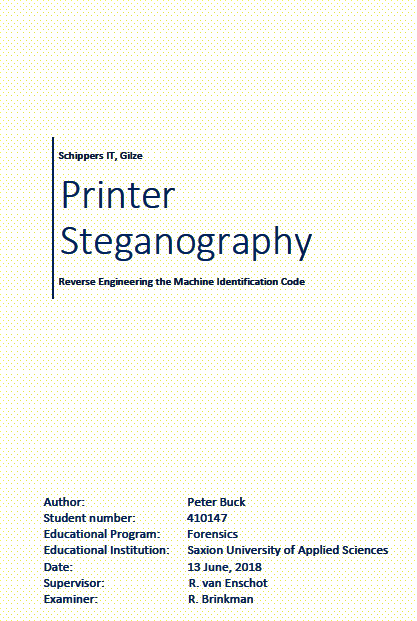 This code, which encodes the time of printing, as well as the printer type and some other information, is described on pages 13-16 in Peter’s publication. Congratulations, Peter, on this great work. I hope, we will see more research of this kind. @Jerry: Thanks, I have corrected it. 1. Are these yellow dot codes also included in documents printed or copied in black and white or shades of gray rather than in color? 2. When a document is copied and then recopied and perhaps recopied again, and perhaps rotated each time, is there such a jumble of yellow dots that they cannot be decoded? 3. Can a sheet of transparent yellow plastic, or some other color, be placed over a paper before it is copied to “submerge” the dots in a sea of yellow or to filter out the original yellow dots? That is, could this be done on a public copier to hide the original yellow dot code? 4. What happens if a sheet of transparent plastic containing “millions” of yellow polka dots is used to cover the paper being copied? 5. What happens to the yellow dots if the copy is made using yellow paper rather than white paper? 1. Nope, the dots are only included if the document is printed in color. 2. Not likely, since the additional dots will be misplaced slighty. Furthermore, the copied paper has to be scanned and printed with specific resolutions. 3. I guess that would work. It would make your document tainted yellow, but it would work. It does depend on the specific yellow intensity. If it isn’t the correct yellow, the dots will remain visible. 4. Same thing as number 3. 5. Also the same answer as 3. Nice work. Do the dots consist of 100 % yellow? 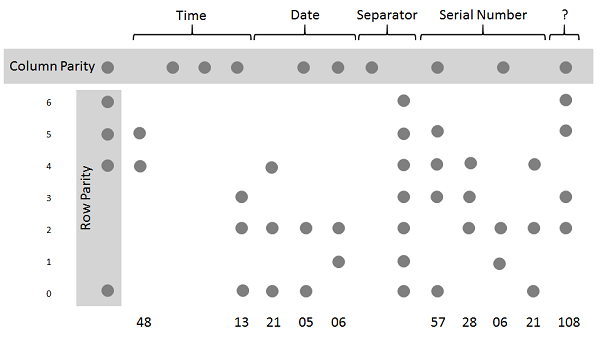 I would then simply add a random pattern of dots to every document I want to print. 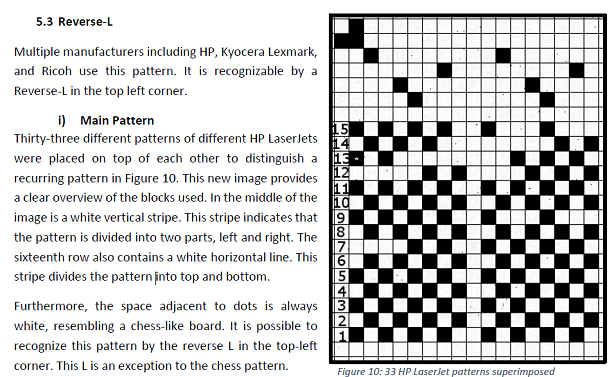 There is a new study on this subject in which 141 printer models where analyzed. They even created a tool that should read out the encrypted information and provide a way to mask the dots.